Coaxial extension cable made of low loss LMR400 sized coax cable. Use to connect SMA radio sources such as modems, routers, etc. to the male SMA connector found on many external antennas or to extend the length of an existing SMA coax cable. Proxicast's coax extension cable assemblies are constructed with top quality extremely low-loss cable and gold plated connectors. Each cable assembly is fully tested. 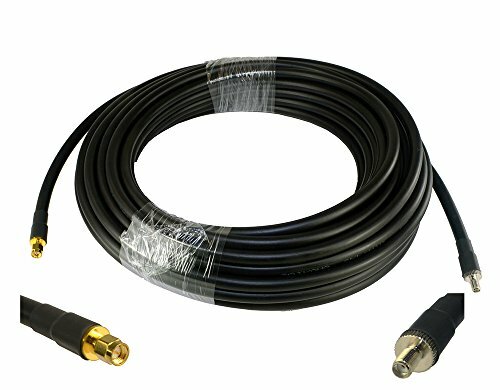 Proxicast recommends LMR195 coax for assemblies up to 10 ft, LMR240 up to 25 ft and LMR400 up to 75 ft. It is acceptable to use a thick cable for the long portion of a cable run and a short thin cable to connect to equipment or antennas, but minimize the total cable length and number of connectors. SMA Female jacks are commonly used on 3G/4G/LTE cellular modems, routers and signal amplifiers - check with your equipment manufacturer. Many indoor cellular antennas have SMA Male connectors; most outdoor antennas have either N-Male or N-Female connectors. RP-SMA (Reverse Polarity) connectors are commonly used on Wi-Fi equipment. SMA and RP-SMA connectors will not mate. Video equipment (cable, satellite, TV, etc) uses "F" connectors - which look similar to SMA but they will not mate with SMA connectors. See the photo gallery above for pictures of the exact connectors on this coax extension cable and note the gender of the connectors you need to ensure male-to-female mating. All outdoor connections should be weather-proofed. Use Self-Bonding silicone tape (ASIN B00K5GW67O) for fast and easy connection sealing. Proxicast is a USA-based manufacturer of wireless equipment. Compatible with all SMA-based equipment including modems and routers from CalAmp, Cisco, Cradlepoint, Digi, Pepwave, Proxicast, Sierra Wireless, Sixnet/Red Lion and many others. If you have any questions about this product by Proxicast, contact us by completing and submitting the form below. If you are looking for a specif part number, please include it with your message.